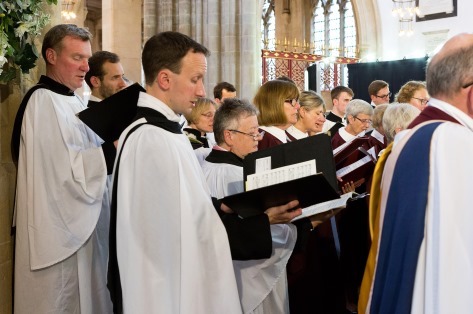 St Edmundsbury Cathedral is fortunate to have no fewer than five choirs. The Cathedral Choir of men and boys is the Cathedral’s primary choir and as such sings the Cathedral’s main services. The Cathedral Choir is assisted by the St Edmundsbury Singers, a ladies choir, and the St Cecilia Chorale, a youth choir. In addition there are two children’s choirs: the Colts Choir, for boys aged 7 to 10 and the St Cecilia Juniors, for girls aged 7 to 13. Click here to view this term’s music diary. Are you in Year 8 or above? Do you enjoy singing? Can you read music? If so, the St Cecilia Chorale needs you! The Lay Clerks of the Cathedral Choir normally sing on Fridays and Sundays, and are all volunteers. We are looking for an additional (male) Alto Lay Clerk, as well as deputy Lay Clerks to cover absences for the current Alto, Tenor and Bass Lay Clerks. Please contact James Thomas, the Director of Music, for further information. The Colts, for boys, meet on Tuesday afternoons and Friday mornings, and the St Cecilia Juniors, for girls, meet on Wednesday afternoons. The Cathedral Choristers (boys) rehearse most mornings before school, and sing on Thursday and Friday evenings, as well as on Sundays. Before a boy becomes a Chorister, he spends roughly a year as a Probationer with a lower committment. If you know of a boy who could sing in the Cathedral Choir, please contact James Thomas, the Director of Music.